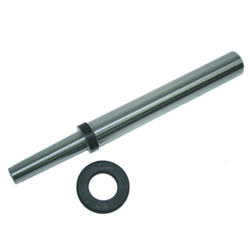 We are regarded as the leading Manufacturer, Supplier and Exporter of Taper Mandrel. These Expanding Mandrel items are sturdily constructed by the professionals and ensure longer functional life. Expanding Mandrel Advanced technologies and modern machines are used while manufacturing these items. Expanding Mandrel We are providing these BT Combi Shell Mill Holders at economical price range. Any type non standard mandrel as per drawings. With enriched market experience, we have been able to offer a wide spectrum of Brass Taper Mandrel. We are offering a large range of excellent quality expanding mandrels to our clients, that are widely used with standard air collets, hydraulic cylinders and other collets fixtures. all our products are designed, using high grade raw materials, which is procured from the best vendors of the industry. Round Wood Bracelet Mandrel Taper - 15"
We are a unique name in the market to provide our honorable customers an exclusive range of Taper Mandrel. Mainly use to check outer diameter and face run out. Our company has gained immense experience in the field of presenting Taper Inspection Mandrel. We are offering Nylon Mandrel to our clients. - Expanding Mandrels are used for holding the job on I.D. - These are custom made as the ID is specific to the job. - These come with taper shank & flanged bolting for fitment on machine. - Wide range of I.D. s can be held with these for various operations on O.D. with I.D. holding. Among all types of Inspection mandrels, most commonly used are Taper and Parallel Inspection mandrels. 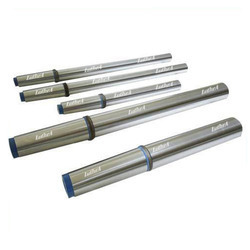 Toolroom Engineers Brand Inspection Mandrels are manufactured with Concentricity and Perpendicularity kept within 0.003 to 0.005 microns and highest quality surface finish.